In this article Canterbury College Guidance Counsellor Michelle Sams provides her first hand account of the success she found after introducing meditation in schools. What are the benefits of using mindfulness and meditation to increase academic outcomes? What evidence do we have that being ‘still’ or living in the present moment is actually a preventative mental health strategy? What specific technology is available to help students meditate and build wellbeing in school settings? Canterbury College contemplated these questions, researched the many and varied meditation programs on offer, and then discovered Smiling Mind. Over four years ago, as Guidance Counsellor I began using the Smiling Mind web based meditation tools with individual students. The outcomes were so consistently positive that Mrs Donna Anderson (Head of College) decided to implement meditation in school across the entire college. In 2015, we hosted a series of Smiling Mind training workshops for students, staff and parents led by Mrs Kay Watts – Research and Education Project Manager from the organisation. Mrs Kay Watts and myself ran a number of meditation and mindfulness in schools workshops for students with great responses and feedback being received from children in years 3 to 6, and young people in years 7 -12. Kay trained all academic staff at Canterbury over two twilight sessions and our school has continued to use the Smiling Mind Mindfulness Education, Individual meditations, and Sport Programs across the entire college (K-12). We implemented meditations via whole year-level workshops, assemblies, pastoral care classes, junior classes, and rugby training sessions. Recognising the current statistics and dealing with increasing numbers of students experiencing significant stress and mental health problems made finding a well-researched and technologically friendly meditation program essential. Smiling Mind utilises technology as a fundamental means to attract young people to the concept of wellbeing, and understands that web and app based programs are two of the most utilised methods for sharing information in children and young people. The Smiling Mind program is easy to access and use, and is free, so everyone can gain benefit from its guided mediations. Canterbury College is continuing to enjoy its journey through Smiling Mind’s Education, Individual and Sport Programs, seeing and experiencing the diverse range of meditations available as well as perusing the comprehensive manuals, downloadable MP3’s and videos. 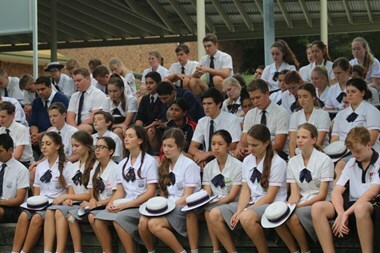 The meditation in schools program is so adaptable that any staff member, student or parent can use it. Many students and staff members have already downloaded the new app and accessed the new Smiling Mind website to support their mindfulness journey at school. There is much research and media attention outlining the effectiveness for children and adults participating in regular mindful meditation including reductions in stress, better mental health, greater wellbeing, increased kindness, increased cognitive performance and enhanced job performance. Canterbury College is dedicated to supporting the mental health and wellbeing of its staff and students. We will continue to join Smiling Mind with the ultimate aim of enhancing mindfulness in schools to bring about positive mind states such as calm, acceptance, clarity, compassion and happiness in all members of our college community. Smiling Mind have developed easy-to-follow curriculums for every school age including exactly how to implement mindfulness in any school whilst embedding a mindful culture amongst students. We will do so by providing accessible, life-long tools to support healthy minds through our FREE mindfulness app with supporting education programs. We are a 100% not-for-profit organisation that works to make mindfulness accessible to all.